The snowy slopes of the mountains bring many people to head out to catch the adrenaline thrill of cruising down the slopes. Make a stretching routine a priority before and after a day on the mountain to significantly reduce the likelihood of soreness and injury and improve your range of motion and flexibility. Remember to avoid going straight to maximum stretch if your body isn't ready and focus on slowly breathing into it. Start by lying flat on the floor. Keep your knees together and raise them slightly. Keep your arms out to the side and then let your back and hips rotate with your knees. Roll knees over to the left, stretching diagonally, then back to the middle, then over to the right. Repeat 3-5 times on each side. 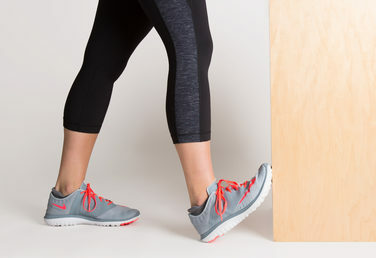 Start in a runner's lunge with your right foot forward. Slowly lower your left knee to the floor. Take a few seconds to find balance, and once you're stabilized, grab your left foot with your left hand. Hold for 30 seconds, then switch sides. Repeat 3-5 times. Stand in front of a couch (or chair). Place the top of your right foot on the seat of the couch. Lower into a lunge and adjust your body until your right heel is nearly touching or touching your right glute. Keep your torso facing forward and gently press your hips forward until you feel a mild stretch through the front of your right hip and thigh. Hold for 10 seconds then switch legs. Repeat 3-5 times on each side. Find a wall you can lean against and face the wall. Flex your right foot and position your heel where the floor meets the vertical surface. Your toes should be elevated, while your heel remains on the floor. Keeping your heel on the ground and your leg as straight as possible. Lean toward your front leg, holding the stretch at its deepest point. Repeat stretch for about 10 seconds on each side. 5-10 reps. Begin standing with your feet hip-width apart then take a large step to your right. Transfer your weight to your right leg and lower into a side lunge until you feel a stretch down the inside of your left leg. Hold for 10 seconds and then switch sides. Repeat 3-5. Save these stretches for before to after a day of skiing. Stretching is crucial to help muscles recover and improve flexibility. If you are looking for an extra speedy recovery, book a massage at either one of LoDo Massage Studio's locations!